This idea came from the Real Clothes comic by Makimura Satoru. One of the characters had a super cute little ghost tied onto his umbrella; it made me want one so bad! 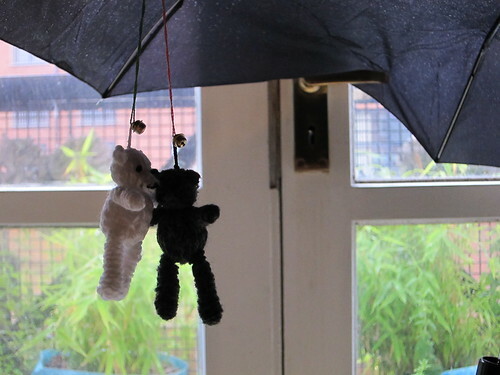 I'm not really an umbrella user, because I fear causing mayhem and injury, but when I realized I could use the wool ball bears I had made back in March 2009, I handed over £6 for the second-finest Superdrug would sell and set to work. The bad: I think I only hit P once, though I may have splashed a stranger as I was folding it to go into a shop. The ugly: Not exactly ugly, but the cute little bells rattle more than ring. That said, you'd never hear it over the sound of traffic on the street. I'll have to watch how well the bears stand up to their new role; it's much more active than gathering dust on the bookshelf, so they will probably need a bit of repair work in the future. Lots of other ideas for dangling rainy day mascots have been popping into my head, so I may give them a vacation when I'm ready for something different.